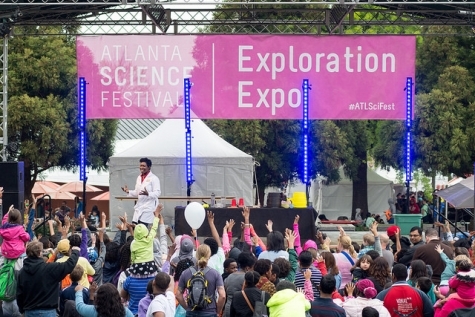 Atlanta’s biggest interactive science event is FREE and open to adults, families, and children of all ages and interests. The Exploration Expo promotes science exploration, discovery and innovation with more than 100 interactive exhibits, hands-on experiments, mind blowing demos and performances! Learn more here. ENCOUNTER ZONE, brought to you by Emory University: Smell the world, solve the outbreak, and see what happens through the plug. DISCOVER ZONE, brought to you by Mercer University & Mercer Health Sciences Center: Explore the microscopic world, 3D printing, robots and bees. INVENT ZONE, brought to you by Georgia Tech: Experience carbon dioxide bubble bombs, drones, brains, and make your own blood jar. THRIVE ZONE, brought to you by Georgia State University: Discover the chemistry in your daily life, Gneiss Rocks, Lung Models, and germ science. CURIOUS KIDS ZONE, brought to you by the Atlanta Section of IEEE: Turn your little ones into future scientists and engineers with STEM & STEAM activities specifically for ages 3 and up. POWER-UP ZONE, brought to you by Georgia Power: Take a break from the science – grab a bite to eat and have a seat at this oasis of tables. Then, put your new energy to good use as you pedal a human-powered generator, form a human circuit, and explore robots and drones. Live Entertainment: Find the science inside the circus, meet live animals from Zoo Atlanta, and meet the youngest person to pilot a plane around the world solo. Collect important cloud data for NASA! To get started, find the Girl Scout citizen scientists in their uniforms throughout the park!